The picture above to you might just look like any picture of a child happily playing but today this little boy in this little picture made me cry my eyes out! This is my little boy James he's 4 and hes my whole world! Hes always been my baby my only little one but with the new arrival on the way in around 4 weeks that is suddenly going to change. 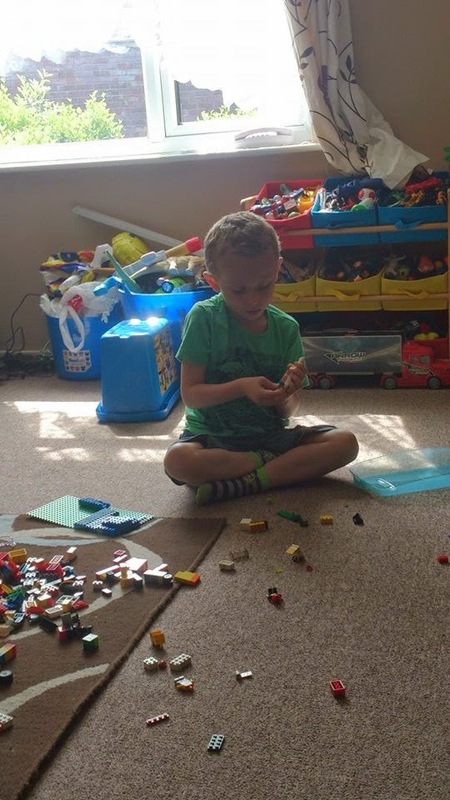 I sat and I watched him today he sat quite happily on the floor building his "motor boat aeroplane" all by himself he didn't want or need my help he was quite happily playing. Chatting away to himself about what he was building and I just wanted to shout NO STOP!! I realized my little man was growing up so fast right in front of my eyes! I wanted him to stop growing I want him to be my little man forever. This year he has grown so much he gets himself dressed, takes himself to the toilet, hes starting SCHOOL! in September and he has such an amazing imagination he can entertain himself for hours on end when he wants to. How HOW can my little baby be ready to go to school (I know really hes ready, he cant wait to go! nursery have agreed hes ready to go) but inside hes still my little baby. He still loves his cuddles on mummy's lap under the duvet of an evening and blowing me kisses when he walks up the stairs to go to bed each night. It just doesn't seem right, he seems so small and so care free. I dont want to share any days, hours or minutes of my precious time with my little man with anyone or anything! I just wish I could wrap him up in cotton wool and just watch him forever! As it gets closer to this baby arriving I am getting more and more scared, How can I share my love? I love James so much my heart melts when he says "I love you mum" or greets me in the morning with "Morning sweet-pea can I come into your bed?" How can I love 2 the same when I feel like there's no more room in my heart for more love because its so consumed with the love I have for James? I know deep down I will just find room my love wont lessen for James my heart will just grow with more love for the new baby but its hard to imagine right now! Sorry for the soppy post but as I sat and wiped away my tears watching James this morning I felt it was something I needed to write down. A feeling I didn't want to keep bottled up a feeling of PRIDE at how amazing this little man is and how much I love him!! I hope your all ok this Monday morning?